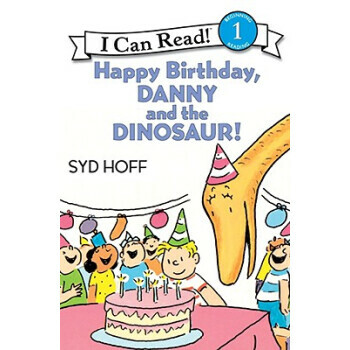 "It is Danny's birthday and he is on his way to the museum to invite his friend the dinosaur to his birthday party. When the dinosaur accepts the invitation, Danny rides the dinosaur back to his house. Danny's parents are decorating the house with balloons and streamers and the dinosaur is able to help because the children can ride on his long neck to hang balloons from the ceiling. When Danny's mother hands out birthday hats, the dinosaur proudly puts his own. When Danny's parents pass out ice cream to all the guests, they have to give a whole bucket of ice cream to the dinosaur. And when the cake comes out with candles burning, Danny has to remind the dinosaur that they must first make a wish before they can blow out the candles. Danny and the dinosaur make the same wish that they can be together next year for Danny's birthday. This "I Can Read" title, with accompanying CD, is a delightful story for the preschool and kindergarten crowd. As these young readers are just beginning to read for themselves, the CD reading along with them and the use of simple sentences of less than twenty words defers discouragement. Audio signals are given to let readers know when to turn the page and there is an additional track providing uninterrupted reading."